New Zealand has very unique location on planet. It is situated in the middle of Pacific Ocean on so called “Ring of Fire”, exposed to all weather patterns oceans can throw at it and thanks to its undisturbed seclusion for millions of years a natural, scenic wonderland had a chance to form. 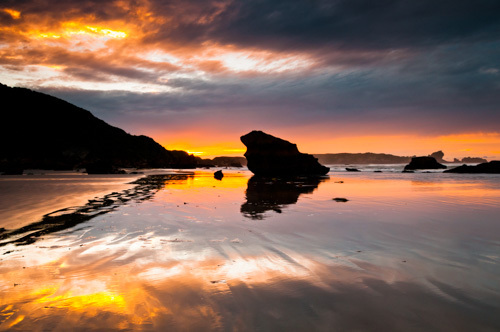 New Zealand has become a destination with perhaps some of the most diverse, wild and colourful landscapes on Earth. Quite possibly for this reasons, it is a dream destination – once in a lifetime experience for many people. South Island with West Coast in particular is an absolute heaven for any landscape photographer, offering such a remarkable diversity on so small piece of land, which is unparalleled in the World. In total, New Zealand has 13 National Parks. 3 are up in the North Island, 1 is in Rakiura/Stewart Island and 9 NP are on the mainland/the South Island. We are going to shoot in Kahurangi National Park and Paparoa National Park. There will be other Reserves of special significance in which we may shoot. The northern part of the West Coast is very special. 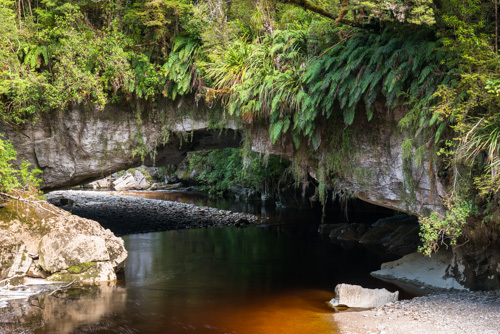 Its amazing limestone formations, caves, arches, tannin stained brown-orange rivers and creeks running through lush green rainforest, stunning rugged coastline in Punakaiki, that all draws visitors from around the world. All this scenery and more is comprised in 2, above mentioned, National Parks which are situated on the West Coast - Kahurangi partially and Paparoa in full. Also, it is only mostly here in the South Island where New Zealand's only palm tree - the nikau occurs....and they are gorgeous to photograph. 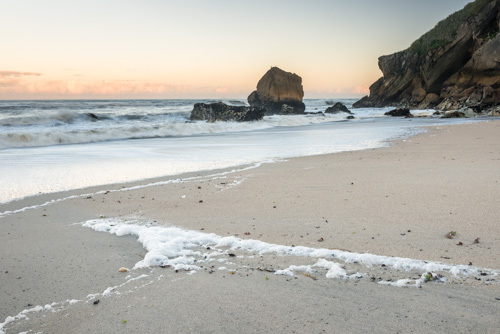 Remarkably different, beautiful granite beaches and grounds in Karamea prove that due to the tectonic shifts, the grounds were over millions of years conveyed over here all the way from very southern part of South Island, from Fiordland. All these breathtaking locations awaits participants of Petr Hlavacek's photographic tours. To reserve your place in tour, a completed Reservation Form, and a non-refundable deposit is required at time of your booking. For more informations and bookings, please read our Terms and Conditions before you make your reservations. Start: pre-determined time and place in the afternoon in Karamea, well before our first sunset session. Today, we jump right into the business full on, as we have a lot to cover. After photographing our first sunrise in Kohaihai, we'll return back to Karamea for quick breakfast before we return back to Kohaihai to photograph NZ native, beautiful Nikau Palms growing next to Kohaihai River. 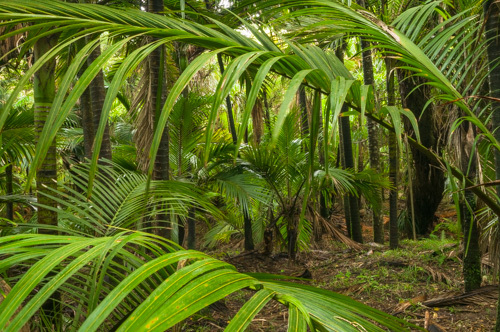 These palms grow in an abundance up in the North Island but in the South Island, it is mostly only here in the very northern part of it, right next to the Tasman Sea where they seem to like the climate. Next to these palms, we'll have a stunning, brown tannin stained Kohaihai River at our feet and we'll be crossing it over the swingbridge to access the Nikau Palm grove. After later lunch outdoors in Kohaihai, we'll set off for about 40min hike to Scotts Beach. Here we'll capture sunset after which we'll walk back in dark. Head torches are necessary. Our second chance for some nice sunrise shots in Kohaihai. 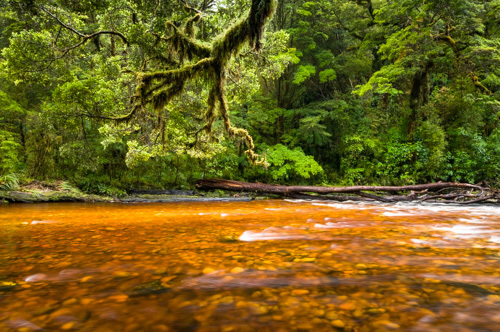 Return back for breakfast before we set off to Oparara Valley, where we'll be photographing beautiful, juicy green rainforest, limestone formations with its famous arches, moss cloaked ancient beech forest mixed with tree ferns and stunning brown, tannin stained Oparara River. We'll return for the dinner to be ready for sunset at location of our choice. Third sunrise but today, we don't have a long distance to travel so we can leave Karamea at a leisure pace. 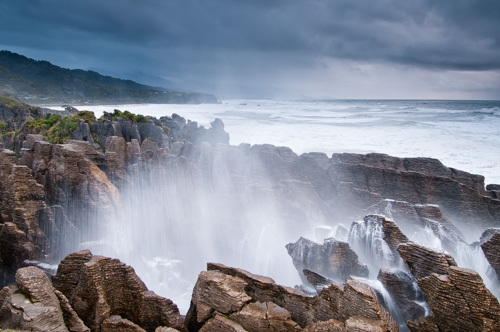 The aim is to get to Punakaiki in the late afternoon for some magical sunset on the famous pancake rocks. 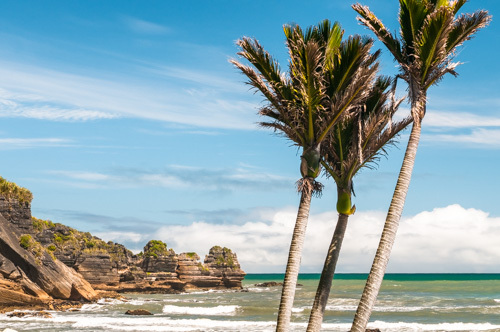 On our way to Punakaiki, we'll stop in Tauranga Bay for a nice cup of coffee and lunch in a stylish Bay House Cafe & Restaurant with great views over and with surfers popular bay. Since the bay is all surrounded by large boulders constantly exposed to crashing waves, there are going to be plentiful opportunities to photograph not only the bouldery coastline but also nearby seal colony, which calls it home here on these rocks. The viewing distance is approx. 20-30m from an elevated platform. 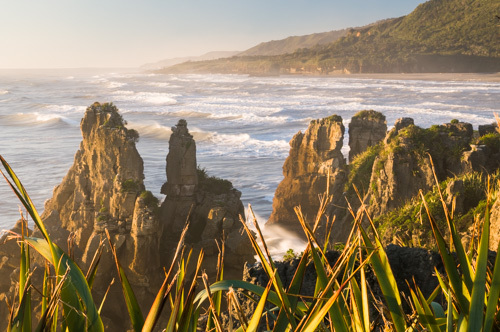 From here, it's only 30min drive to Punakaiki but those 30min will be packed with fantastic corners of the rugged coastline. We should be on our way just after the lunch time so we can make use of these corners to make some great images in the afternoon light. After checking in and some nice, early dinner in Punakaiki Resort, we'll move to our location to make some great images of the famous Pancake Rocks at sunset. This morning, we'll have an early start to capture some brilliant skies, as the sun rises on the east coast. Like on the last night's sunset session, ND graduated filters will be a must because lit up skies will contrast with a still in a shadow Pancake Rocks. This morning exercise will take us through for a late-ish breakfast, after which we may further explore the area. 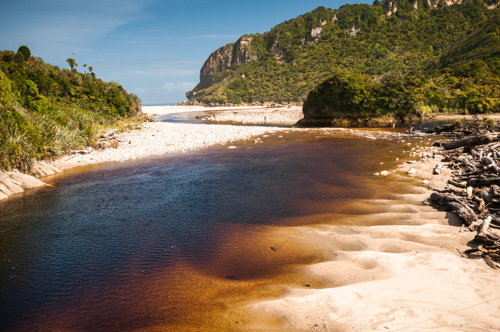 After lunch in Punakaiki, we'll drive for a few minutes to Fox River to hike a little along the river, being back to photograph sunset on beach full of amazing limestone formations. End of tour after return to Punakaiki accommodation. 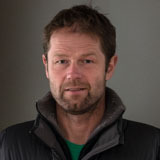 Petr Hlavacek's tours/workshops are designed to suit broad range of fitness levels. However, some longer walks (2-4 hrs return) over uneven, uphill and rugged terrain may be required on this tour. Therefore, good level of fitness is recommended, as well as the ability to carry your own small back pack with extra clothing, snacks and camera equipment. Please, discuss this with us if you have any concerns. 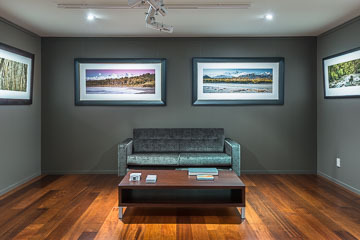 Photographers of all skill levels, from beginners to professionals will benefit from our tour. Beginner needs to have a good working knowledge of their own camera system to benefit the most from this tour. Professionals will benefit since we take care of the logistics and bring them to the best locations straight away so they can purely concentrate on shooting, rather then waisting time scouting. All of Peter's tours are designed to make most of the locations and weather the group we'll be presented with. You will learn variety of creative techniques in field which professionals use to capture most compelling images, including ND Gradual and polarizing filters. We'll be pre-visualizing images, assessing light conditions, we'll learn how to find a strong composition within a scene to make a photograph speak, whether in a landscape or icescape. In the evenings, you will learn about photography RAW workflow from capture to output and how to bring the best from the image file in postproduction using Adobe Lightroom and Photoshop. Due to New Zealand's location the weather can be extremely changeable. We are not going to be shooting in pouring heavy rain, but it is well possible that some rain will get us on our way to or from the location. Due to the geographical location of New Zealand, the weather can be extremely changeable and will play a major role on our tour. For this reasons and other specifics of this tour, this itinerary is flexible and fully subject to change. 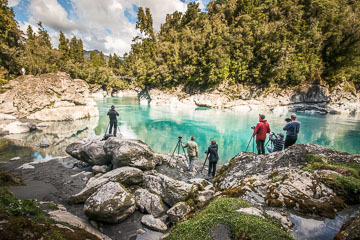 Assuming that participants on this photo adventure trip will be arriving to New Zealand for longer period of time than for the duration of the trip only, we decided not to include transportation for this tour. Instead, we expect participants to have their own transport so they can carry on in their holiday before/after the tour. For this reason - there is no transport provided for this tour and participants are expected to arrange their own transport throughout the length of the tour, as well as getting to the Karamea location for the start of the tour. In an effort to secure as good weather as possible for this tour, we decided not to exactly specify and book the dates; rather we've decided to select one week in which the 4.5 days of our tour will take place. This solution should give us much better chances of catching the best weather window for our photography and make the tour in this wild but truly spectacular location a great success. 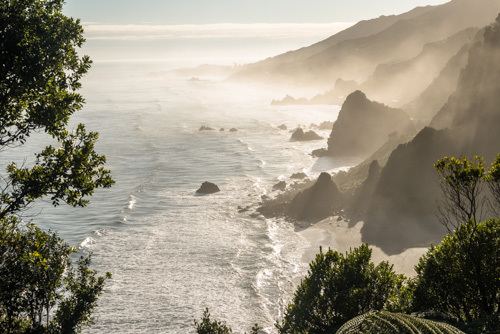 Since we will be in contact with you, our clients, before and as soon as you arrive to New Zealand, we will keep you well informed and updated with weather situation. This way you will be able to adjust the time of your arrival to Karamea in best available weather window on the West Coast. This will also give you much better chances to organize and enjoy the rest of your stay in New Zealand to your benefits. Should you need to, we would be happy to advise and help you with booking the car, your plans and accommodation for the shoulder days around the tour. 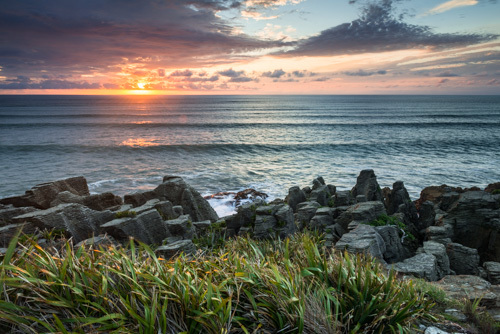 Once in Karamea, we will continually be assessing the weather conditions on daily basis and alter the tour to the benefits of the photography. For instance, should the weather be too bright and sunny for the shoot in a bush, we may change the location and leave the bush for the overcast day if possible. These possible changes will be made by us in the mornings and during the day's development. Some sunrises are also subject to changes, allowing clients to decide should they be tired but otherwise we will be attempting to photograph during every available sunset and sunrise. 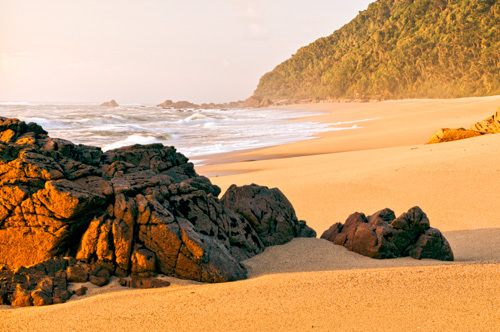 - Optional activities such as helicopter, plane flights, boat rides, kayaks etc. We highly recommend purchasing the travel insurance and insurance of your air ticket in case you will not be able to attend the tour and have to cancel the air ticket.